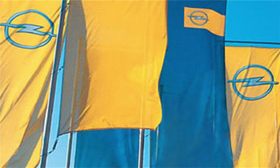 Opel's unions have been pushing for an independent European Opel/Vauxhall group. Opel's dealers have offered help for the troubled carmaker that could include cash aid or taking a stake in the company. "We are ready to invest in Opel's future," said Jaap Timmer, chairman of the European Opel dealers' association EURODA. Opel's management will present a new business plan for the carmaker's future to the company's supervisory board today. Opel's unions have been pushing for an independent European Opel/Vauxhall group that would include outside investors such as the brand's dealers. Timmer said: "We represent over 4,000 dealers from 24 European countries and I can assure you that each dealer stands behind Opel." Dealers could invest in shares in a new Opel company that is separated from its parent General Motors, he said. Timmer said financial assistance for Opel could be a possibility although any proposal would have to be discussed among dealers first. "One could think of a various ways of contribution rather than a huge one-time amount of money. This could lead to a share in a new Opel, but we have to explore all the options first." Opel is seeking help from the German government to finance a 3.3 billion euro ($4.15 billion) liquidity gap through the end of 2011, according to company sources. Chancellor Angela Merkel told a news conference in Berlin on Thursday that if Opel receives any state help, the priority would be financing guarantees rather than more direct state aid. Opel and its UK sister brand Vauxhall have been hit hard by a slump in new-car sales. Last year, European sales of Opel/Vauxhall fell 14 percent to 1.15 million units.